These perfumes were sent to me in exchange for photographs by Femme Fatale Cosmetics, all opinions are my own. Good morning! 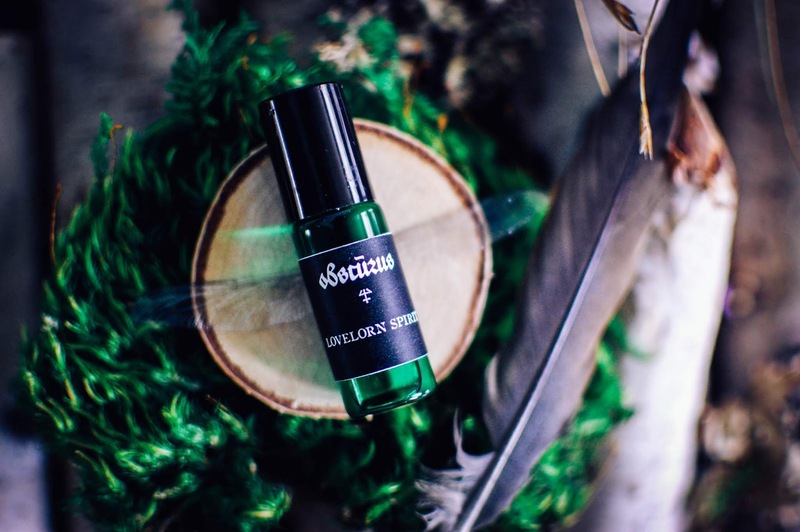 Today I want to share with you the Spring 2018 perfume collection from Obscurus. 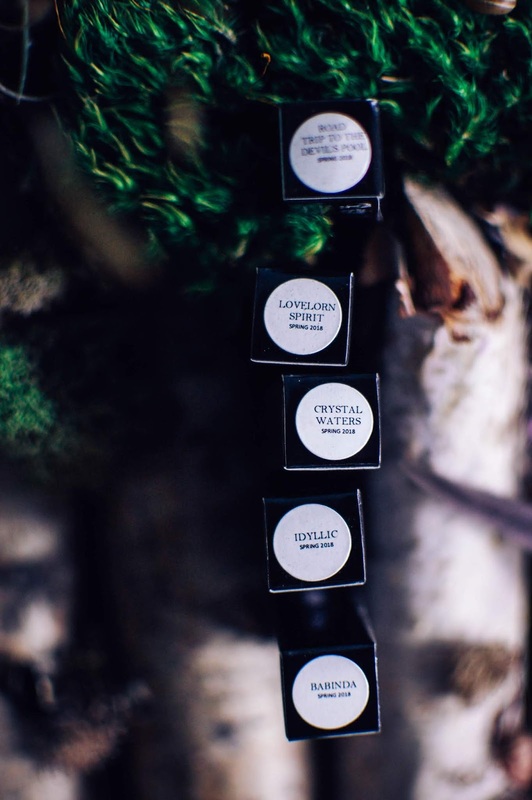 These perfume oils come in sleek tiny boxes with the scent labeled on the end. 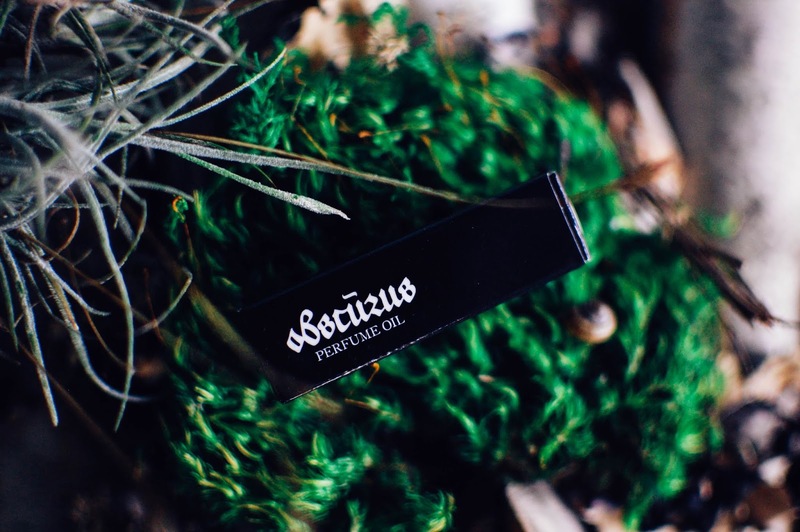 The perfumes are in jade green glass rollerball vials with black caps and contain 5ml worth of perfume oil for $16.38 each. There is also a sampler option in 1ml vials if you just want to give them a brief exploration. I am impressed with how these are presented and how tidy they are, how well they travel. Only one had a slight leak and it wasn't that bad at all as far as liquid lost. 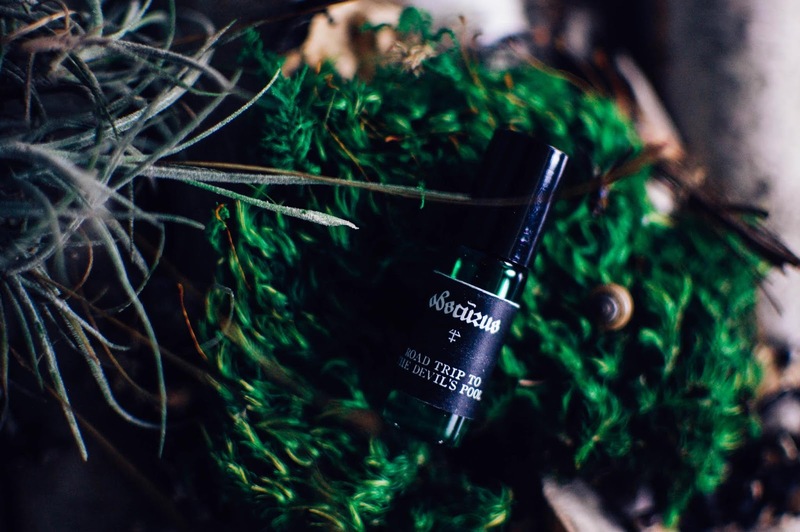 This collection of five fragrances is inspired by Babinda Boulders in northern Queensland, Australia. This particular place is known as The Devil's Pool and mystery, death and legend swirls about the turbulent waters. Femme Fatale links this article for further reading. Road Trip to the Devil's Pool- Notes: Fig, moss, amber, leather and peach. Rolled onto the wrist, the hazy hot scent of petrichor fills the nose. A summer thunderstorm striking the sun baked stones of the road and sending up a steamy incense of tarmac and dust. Bare thighs stick to the truck's cracked and worn leather benchseat. The wind snatches at tendrils of hair through the silver of window where the muggy air rushes in and out. Rain, heat waves on paved roads and leather. 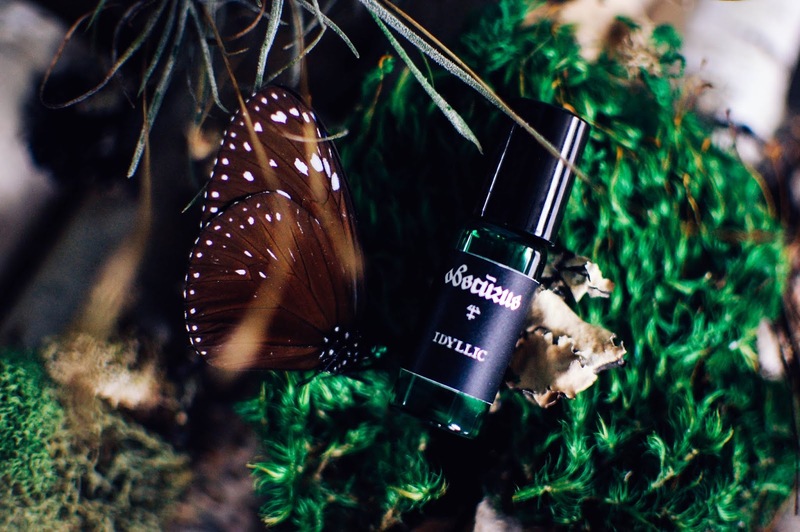 Idyllic- Notes: Fresh green tea leaves, citrus, red currants, a soft hint of floral and a teak base. A handful of wild gooseberries stain tender lips and curious tongues with their rosy tart juice, gathered when roaming the idyllic woods near the rushing waters. Sweet waters and the gentle herbs swaying within them balance the tart berries and lure like so many crooking fingers. Come. Come walk in the crystal clear coolness. As the scent warms and dries on the skin, the teakwood and florals heat the scent and it turns from its fruit and herb cool green tea vibe to summery woods and ripe fruits along meandering trails. 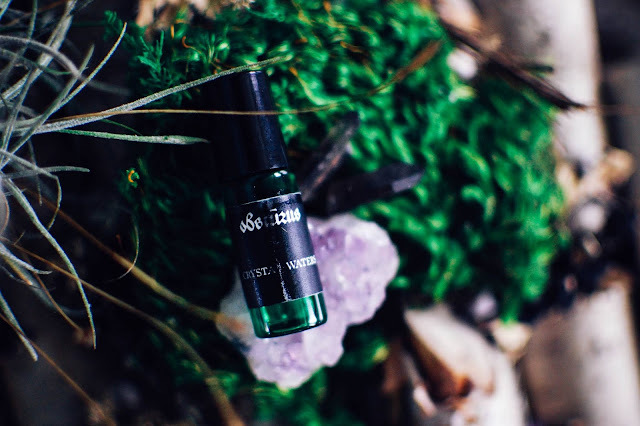 Crystal Waters- Notes: Damp, rich soil and moss, a hint of floral and fresh raspberries and fruit. A hidden lagoon, crystalline aqua and rich with minerals, ripples with the life given by a spring boil that jettisons limestone chilled water to the surface. Hanging damp mosses and black soils of the forest floor give way to the sandy ring that embraces the lagoon. Dainty purple flowers cascade down their stems to touch their faces upon the undulating pool. Their subtle sweetness joining the moss and earth to perfume the air. This the scent of sweet garden soil in March. Of freshly sprung mosses on a shaded mountainside. Fruits in their soft ripe fullness. Flowers in their all their unfurled finery. This is nature at her most beautiful. Lovelorn Spirit- Notes: Cool, clear notes, earth and foliage and crisp, sweet apples. The misty apparition beckons with watery grace. Sadness and yearning eddy around her like a burbling stream. She smells of the sacred oak leaves sacrificed like tears from the trees bent over her and the tannins within. Almost amber in their sepia tones. As the scent dried down, aquatic musk swirls about her, as she wavers into the final wisps of her being. 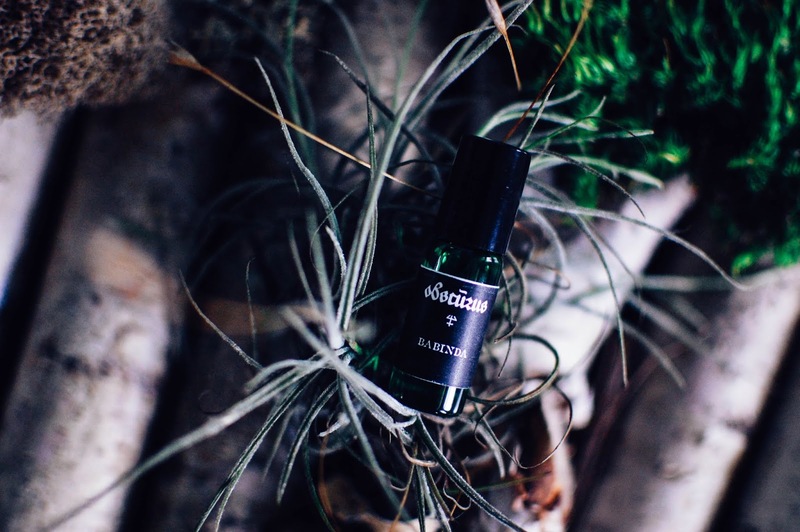 Babinda- Notes: Cherry wood, chypre, tobacco, earthy tones and a hint of spicy caramel. Russet filters of sunshine shimmer on the stone boulders of Babinda. Red ores and minerals stain the tops of the rocks and match the aroma of mild cherry tobacco. Earth borne, sweet and warm. Clay tones emerge as the cherry wood and tobacco mellow. The sweetness of the day winds down and leaves its mark on the newly bronzed skin and its mark on the heart, wrapped in mystery. These perfumes are very well blended. Even though I have never been to Australia these fragrances transport me there. They illustrate places and images and feelings that are evocative of this legend and I enjoyed immersing myself in it. Most of these wore close to the skin if dabbed on lightly but had a nice subtle strength. A greater sillage could be had if it was rolled all over with abandon as I like to do. I enjoyed them all but Lovelorn Spirit stayed with me in a way really touched me. I was beautiful and ethereal and not my scent genre usually, but I fell hard for it. My favorite aquatic to date. Which of these sounds like something you would like to wear? Do you like perfumes built around locations? What location would you make a collection around? I think one with Savannah, Georgia as its muse could be interesting. What a cool company, your perfume descriptions especially have me pining. Lovelorn spirit sounds like a nymph and I love aquatics! I think, from what I know of perfume, I like light and ethereal anyway. That spiky nest photo is brilliantly done. I don't know if I can manage the exchange rate atm with shipping, but perhaps another time. I do think building scent around locations is the best idea, more real than around an abstract concept. I would love to try some location scents, Savannah would be weeping willows, spanish moss, lilies and river damp, I think. I am really digging the branding and quality that revolves around Obscurus. I normally shy away from aquatics but when they are well done they blow me away. And Lovelorn Spirit is one that blows me away. I really should lean more towards them during the summer with all the heat and humidity and sweating that takes place. Thank you! I feel a little more anxious about the photos when I know that is what is wanted. Thankfully I think these turned out ok. I got some creative juju going. I enjoy scents built around locations big time. Especially if it is somewhere I have been and it helps take me back. 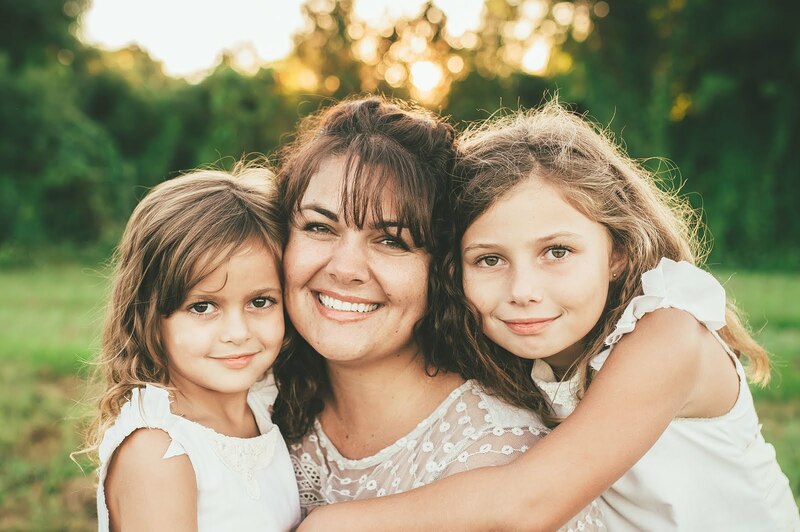 I would love your rendition of Savannah. It would be perfect.